All New paGO Commerce: It’s Mobile-FAST! The folks at ‘corePHP’ announced an all-new high-performance back-end for paGO Commerce. Yesterday, ‘corePHP’s CEO and Chief Technology Officer Steven Pignataro announced the latest stable release of paGO Commerce, version 1.1.1. The big news was the creation of an all new back-end admin interface for paGO Commerce. The new back-end makes paGO easier to use, lighter weight, and faster for store owners to manage their online businesses. Whether you’re creating an online retail shop, an app store, product directory or your own custom event registration system, paGO Commerce for Joomla is the fully capable eCommerce suite you need to customize with ease. We’ll go into more detail in tomorrow’s blogpost, but feel free to download paGO for Joomla! now, and give it a try for yourself! It’s free, open source, and built to help you move more product, easier and faster than ever. Built to adapt and scale like no other Joomla extension. paGO Commerce is the most capable and versatile eCommerce solution for Joomla. While it’s easy to deploy and use, it’s not for hobbyists, paGO is a fully functioning eCommerce suite. Don’t let the simplicity of its design fool you; it’s architected to give store owners the dashboard they need to make quick changes at a category or granular level. Plus, paGO Commerce is engineered to meet the demands of professional developers and systems integrators, using best practices and coding methods to ensure it’s as future-proof as possible, allowing for rapid growth, easy snap-in of apps, add-ons and custom themes. There’s no need to touch (“hack”) the software’s core code, so your developers won’t have to worry about applying future updates to paGO Commerce or Joomla, for fear of your site breaking. Now, your crew can focus on enhancing and fine-tuning your online store’s capabilities, rather than on costly maintenance, security vulnerabilities or repairs. The Open Road is all yours. 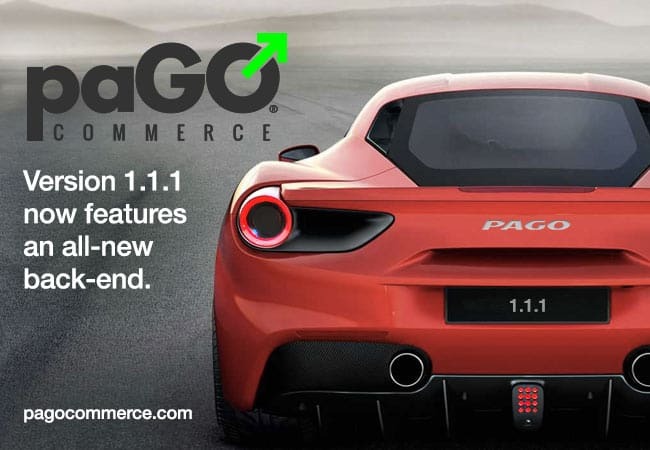 Take paGO Commerce 1.1.1 out on your own test track today. paGO Commerce for Joomla is totally free and open source, with no strings attached, when it comes to privacy or data ownership (Think about it…do you really want to give your customer data away? No.). So what are you waiting for? It’s time to download paGO for yourself, and get GO-ing! No problem, we’re here to help! At any given time, ‘corePHP’ has several eCommerce development projects in progress, from migrations and minor customizations to a total custom build. We’ve got a vast network of professional developers and systems integrators who can help you as well! Contact our eCommerce solutions team today to discuss your project, and the steps we can take to help propel your organization’s digital content, marketing and sales efforts. You’re also welcome to call me at (269) 447-1833 to help get your project pointed in the right direction. This entry was posted in 'corePHP' Products, E-Commerce, paGO Commerce and tagged e-commerce, ecommerce, Joomla, paGO Commerce on May 27, 2015 by John Coonen.